Little by little, Colton begins to tell his parents that, during his surgery, he had an out-of-body experience and was taken by angels to heaven where he saw Jesus. At first, his parents do not believe him, but as he begins to describe more details, they begin to wonder if he really did go to heaven. Colton describes meeting Todd’s grandfather, who died before Colton was born. The clincher is when Colton tells Sonja that he met the sister whom she miscarried before Colton was born. Colton had no way of knowing about the miscarriage, since it had never been mentioned in his presence. Eventually, the local media learn of Colton’s story, and come to interview him and his parents. The family become local celebrities, enduring unwelcome attention, along with jokes and teasing. Much of the movie centers on Todd’s dilemma: Does he believe Colton or not? How does he deal with Colton’s experience in his preaching and ministry? The church becomes divided, wondering if this experience is consuming Todd to the point where he cannot effectively minister to his congregation. It even gets to the point in which the church board threatens to fire Todd if he cannot get his act together. 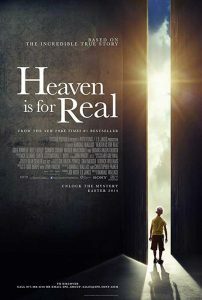 “Heaven Is for Real” is a small movie which has become a surprise hit. It appeals to both Protestant and Catholic Christians. The movie has the feel of a cable TV movie, made on a modest budget. In a way, this works in the film’s favor: it’s simple and straightforward, without dazzling sets or special effects. One of the most effective aspects of the movie, like the book, is young Colton himself. He’s a kid, simply reporting his experience, without any effort to evangelize or persuade anyone. Effectively played by Connor Corum, Colton is matter-of-fact about his experience, and wonders why anyone would doubt him. Often when Todd or others question Colton about heaven, he lets them know that he’d rather get back to playing. I thought it rather odd that a congregation of small-town evangelical Christians would become so divided over Colton’s experience. No one was forced or coerced into believing the experience. Todd sincerely seems to wrestle with the veracity of Colton’s experience, but I didn’t see why the church was on the verge of firing him. In general, “Heaven Is for Real” works well. It benefits greatly from a good cast of Hollywood actors, including Greg Kinnear as Todd along with Thomas Haden Church and Margo Martindale as members of the church board. There’s a particularly nice scene in which Kinnear and Martindale comfort each other at a cemetery. Martindale mourns the death of her son, a marine, in Afghanistan. I wish director Randall Wallace had refrained from dramatizing the scenes with Colton in heaven. I know the vision of heaven is from a young boy’s perspective, but they seem corny and inauthentic. Jesus looks like he’s taken from a children’s book of Bible stories. People walk around like they’re in an ordinary neighborhood. The small Nebraska town looks a bit idyllic as well. Everyone looks squeaky-clean, with just the right number of Black and Hispanic citizens, without any tensions or social problems. At least 90 percent of the townsfolk seem to have bright blue eyes, too! I doubt that “Heaven Is for Real” will convince any skeptics about the existence of heaven. But, like Colton, it isn’t heavy-handed. The movie allows the Burpo family to tell the story of a remarkable experience to anyone who is open to listening. I can appreciate that approach.